Acreage with 3 kms of Beachfront and unique biodiversity!!! This Dream Beachfront Acreage is a rare opportunity to build a one of a kind development project along Nicaragua’s Pacific Coast. 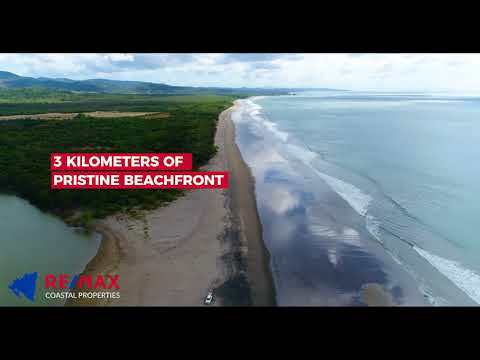 Boasting 3 kilometers / 1.8 miles of untouched beachfront with a total size of 3,327 acres / 1,346 hectares, the only limit is one’s imagination to build a landmark development project in Central America’s fasting growing market. Beyond the sheer size of the property, the biodiversity within it is truly unique. Precious hardwood trees such as mahogany, teak, and cedar, as well as evergreen, laurel and countless other species can be found throughout the property. Due to the minimal current use of the land and active reforestation by the owners, the area is a sanctuary for wildlife. Deer, monkeys, armadillos, iguanas, parrots, and countless other animals can be found roaming freely throughout the property – making it a paradise for nature lovers. The property has a large underground water reserve, making the resource abundant within the property and adding to the ecological allure. A river that runs through the property turns into a salt marsh which contains fish and shrimp. There is also a 3+ acre island, filled with mangrove trees, that is favored by migrating birds as well as ducks and white herons. Currently, two wells on the property provide fresh water for cattle and the small organically oriented farm. The farm produces strong cash flow with it’s current production which is sold to a Fortune top 10 company which distributes the produce through it’s retail stores throughout the region. Acreage of this size along the pacific coast rarely becomes available, especially with this amount of beachfront; opening up endless possibilities to create an anchor development such as Rancho Santana, Hacienda Iguana, or Guacalito de La Isla / Mukul. The property is large enough to contain various developments / communities, as well as golf courses, and agricultural pursuits. This property is a blank canvas to create a legacy project that will help define a rapidly growing Nicaragua!